pre-empted by the Adoption Auction Friday, January 21st. Build your own or adopt!!! 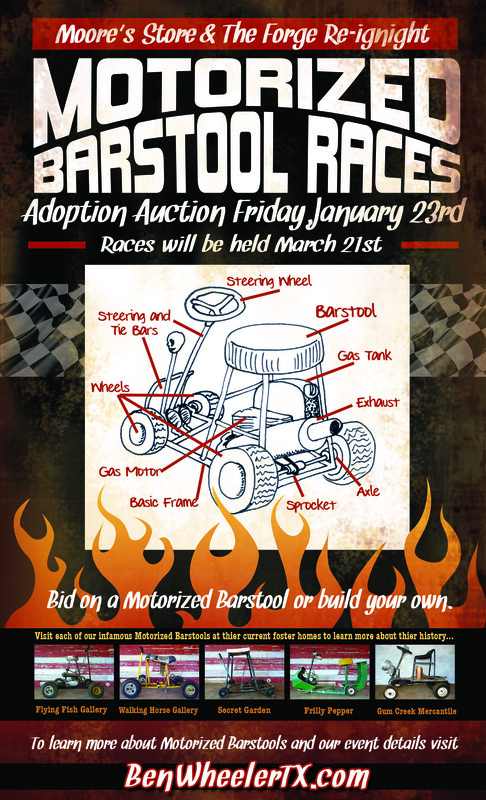 So you want to be a Motorized Adoptee…You must attend the Adoption Auction to be held January 23 @ Moore’s Store! There will be a live auctioneer, foster barstools on display, live music and full bar. To check out potential adoptions, please go to the approved Foster Homes at the certified Ben Wheeler Merchants: Flying Fish, Frilly Pepper, Gum Creek, Secret Garden & Walking Horse. Adoption bids will start at $100. Barstools must be available for future Ben Wheeler events & annual races, not show signs of abuse, & kept in good working order. There will be an annual inspection by an authorized B.W.B.P.S. field agent to decide continued placement or removal from the premise. There is a silver lining, if you have the skills and wherewithal, we welcome you to create your own motorized barstool. Just be sure to check out the Ben Wheeler Motorized Barstool Racing Rules and Regulations.